Food in the South of France: a brief gastronomical tour! Perpignan; Carcassonne; Beziers; Montpellier; Nimes; Chateauneuf-du-Pape; Avignon; Arles; Aix-en-Provence; Marseille; Cassis; Toulon; St Tropez; Frejus; St Raphael; Grasse; Cannes; Antibes; St-Paul-de-Vence; Cap Ferrat; Nice; Menton; Monaco. Food in the South of France is above all the product of its environment. Permeated by mediterranean influences, its cuisine has been moulded by the sun and the sea. The sun-drenched, fertile soils produce richly coloured vegetables and fruits, aromatic herbs and the olive oil which supplants butter in Provencale cooking. Camargue lamb has that special flavour which comes from grazing on the salt marsh grass, while the slopes of the Pyrenees provide hams and charcuterie, not to mention early peaches, apricots and other stonefruit. 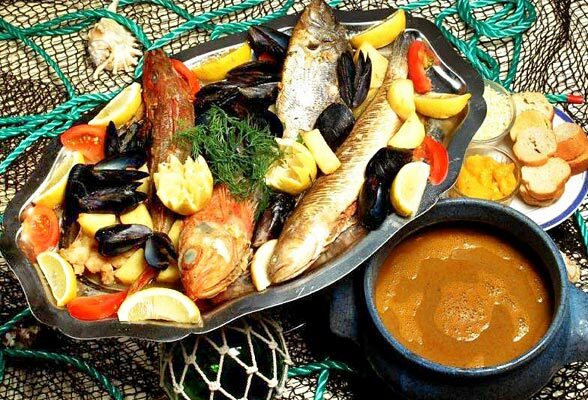 Marseille is the seafood capital of Provence and its most famous dish is bouillabaisse. The two main varieties are Bouillabaisse du Ravi and Bouillabaisse du Pêcheur. "Ravi" contains six different types of fish while "Pecheur" tends to be a bit smaller and lighter, containing only three types of fish and is more often served at lunch. But that’s not the only seafood speciality: "Bourride" is a garlic fish stew. And don’t miss Brandade de morue: originally from Nimes, it is a puree of salt cod combined with cream, garlic, olive oil and potatoes that’s served as a starter. Vegetarians eat well in the South! Vegetarian dishes are also excellent in the Provence region; you’ve probably heard of ‘Ratatouille’, a combination of eggplant, peppers and herbs which is stewed in olive oil, and "Pistou" is a sauce made of basil, garlic and olive oil often used to flavour vegetable and bean soup. Salade Nicoise is served worldwide, but it should always contain long green beans, tomatoes, anchovies, black olives, hard-boiled eggs, and some kind of lettuce. If you want a vegi (sort-of) snack then "Pissaladiere" (which got its name from pissala, a fish paste made from anchovies) is basically a French version of Pizza Napolitana, with less cheese and added onions. Although lamb is the most popular meat in the South, Daube de boeuf a la provencale is always quoted as the classic dish for carnivores. Basically it’s a delicious beef stew with anchovy paste and red wine, cooked VERY slowly (we’re talking five or six hours here) in a "daubière", a heavy casserole or pot with a concave lid. In the days of wood fires, the lid would be filled with water to help radiate heat around the stew. Just thought you’d like to know. Desserts? Don’t go by the "tarte au citron", a sweet pastry tart filled with lemon cream. Menton is as famous in France for its lemons as Sorrento is in Italy, so look out for it if you’re round there, but you can get it in most places. Last but definitely not least, although the South is definitely not Bordeaux or Burgundy, there is still good wine to be had. Try a chilled rose for a change, Estandon (St Tropez) is good. Bandol is a red made from Mouvedre grapes and one of the few quality reds, and Muscadet de Cassis is a fine sweet white. Pastis is a local aperitif made with anise, the slang term for it is "Pastaga" (or "Pastagasse" if you say it with a strong southern french accent)! Food in the South of France bursts with mediterranean colour and flavours, not necessarily as subtle as elsewhere in France, but it will probably be the most enjoyable part of your gastronomical tour! RATATOUILLE!! Sounds good(: i want me some french food now.